This is the first part of a two part series article addressing critical environmental issues as they are associated with the mission and goals of Homeland Security. The first part article of this series will be centering on two of the U.S Environmental Protection Agency's (EPA)'s Homeland Security Strategies published in September 2002. Those strategies visited pertaining to this issue will be critical infrastructure protection protection and communication and information. Many of us still remember the destructive picture at the end of the Persian Gulf War of Saddam Hussein's blowing up of his country's own oil fields. This deliberate act of terrorism caused many ecological harms and set an example of what capabilities are possible internationally and nationally. The United States years later experienced another unwelcomed sign with the disaster of September 11, 2001 ("9/11"), and the twin towers of the World Trade Center. This incident focused attention on readdressing EPA's 30 years of protecting the environment and safeguarding human health. After 9/11, further cause for concern was demonstrated by the attacks of anthrax releases directed at several specific targets. As a part of the EPA's home land security strategies, the commitment to assess and reduce vulnerabilities is a high priority, along with upgrading the detection and response capabilities for critical infrastructures. Also, there are six specific goals that center around the critical infrastructure protection process. As a part of the EPA's homeland security strategies, the commitment to assess and reduce vulnerabilities is a high priority, along with upgrading the detection and response capabilities for critical infrastructures. The goals provide security for drinking water and wastewater utilities, the chemical industry and those parties responsible for clean air. The U.S. Department of Homeland Security has already made an impact, as I have personally noticed municipalities beginning a process to get up to speed on the EPA's new strategies. Even though there were specific Risk Management Plans due in June of 1999, the efforts I am seeing transpire reflect a much more aggressive planning and training effort. EPA is providing direct grants to large drinking water utilities for vulnerability assessments, security enhancement designs and/or emergency response plans. As plans are completed, emphasis on implementation of security enhancements will continue to increase. By the end of fiscal year (FY) 2003, all water utility managers will have access to basic information to understand potential water threats, and basic tools to identify security needs. By the end of FY 2003, all large community drinking water utilities shall have identified key vulnerabilities and shall be prepared to respond to any emergency. By the end of FY 2004 all medium community drinking water utilities shall be in similar position. By 2005, unacceptable security risks at water utilities across the country will be significantly reduced through completion of appropriate vulnerability assessment: design of security enhancement plans, development of emergency response plans and implementation of security enhancements. The next goal for the EPA is to work with all states, tribes and partners to enhance security in the chemical and oil industry. The risk of terrorist attack into industrial facilities that store large quantities of hazardous chemicals is a pressing homeland security issue. According to the EPA, there are 123 facilities where a release of chemicals could threaten more than a million people. Dr. Evaristo J. ("Tito") Bonano, president and CEO of Beta Corp.International (Beta), states "there is a tremendous need to enhance our present efforts to systematically (1) identify the most vulnerable assets in chemical plants and refineries, (2) determine what are the likely terrorist aggressions against those assets and (3) assess the impact on those assets in the event of a specific terrorist attack. Such systematic assessments will provide the basis for identifying and determining the necessary protective measures that should be implemented." According to Bonano, "At the present there are no federal guidelines in place to require chemical plants to assess their vulnerabilities and to take steps to reduce them.," He adds that "tools for such type of assessments have been developed for use by the military and other government agencies in their facilities, and those tools can be adapted or modified to render them applicable to chemical plants and refiniries." 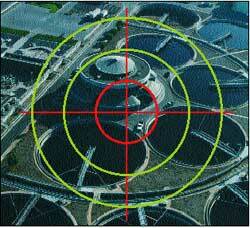 Beta has developed security assessment tools for the U.S. Department of Energy. There are 15,000 facilities that are subject to risk management plan (RMP) requirements. It is believed that the Homeland Security Department and EPA will create a high priority list to establish minimum requirements for the security improvement and reduction of potential hazards to the chemical industry. Reducing the vulnerability of indoor environments in buildings to chemical, biological and radiological (CBR) incidents. Ensuring that critical environmental threat monitoring information and technologies are available to the private sector, federal counterparts and state and local governments to assist in threat detection. EPA will be an active participant in national security and homeland security efforts pertaining to food, transportation and energy. EPA will manage its federal, civil and criminal enforcement programs to meet its homeland security, counter terrorism and anti-terrorism responsibilities under Presidential Decision Directives (PDD) 39, 62 and 63 and environmental civil and criminal statutes. More information on EPA's strategic plan can be accessed at www.epa.gov. The second part of this series article focuses on the strategic goals, tactical action initiatives and benchmarks surrounding communication and information EPA will use from reliable environmental internal and external sources to ensure informed decision making and appropriate response. Some of the tactics included in the strategic goals result in EPA having the ability to collect and analyze environmental information from all necessary sources to respond to incidents and threats. Other issues include creating linkages between health and environmental data flows and EPA access portals support flows analyzes and tools necessary to monitor and respond to incidents and threats. EPA is providing direct grants to large drinking water utilities for vulnerability assessments, security enhancement designs and/or emergency response plans. Effectively disseminating timely, quality information to all levels of government, industry, and the public allowing them to make informed decisions about human health and the environment. Exchanging information with the national security community to prevent, detect and respond to terrorists threats or attacks. EPA will continuously and reliably communicate with employees and managers. Communications is critical to a good emergency response plan as indicated by Neil Nixon, president of Nixon and Associates, a nationally recognized communications management firm with offices in Houston, Texas, and Washington D. C.
Communications, as Nixon comments "requires a focus on personal communications, protocols and the establishment of communication lines and personnel resources." "To avoid thick and cumbersome emergency plans not effectively being used, it might be helpful to follow the steps listed below to make your plan easier for personnel to grasp", according to Nixon. Take out information that doesn't have anything to do with response. Yes, this means plan maintenance procedures, training requirements, etc. (We've even found a client who had information for how to fill out an expense report at a field location in their emergency plan). It's not that this information isn't important, but it's not vital during an emergency event. Place these materials in a separate manual or publications and call it something like "Guidelines" or "Standards" for Emergency Response. Make sure your plan details channels and filters for communication. Just like in warfare, an effective response to a crisis requires good, timely and accurate information and intelligence. Who is responsible for triggering mobilization of the emergency response team? What parties notify other, support resources, such as the organization's environmental, legal, public relations and human resources functions, among others? Write specific response steps for functions and individuals in checklist form, rather than in narrative. Separate duties and actions into succinct steps that can be referred to easily and quickly. Consider such visual aids as color coding, flow and organization charts to liven up your plan and cut down on the wording. If your plan is really thick and bulky, consider making an abridged version that just covers the key communication steps necessary to activate responders. This cheat sheet might also include high-level response steps for key individuals and functions and could also include emergency contact numbers for personnel. We've designed such inexpensive sheets for our clients on eight-fold cards that can easily be carried in a briefcase, put in a vehicle's glove box or placed by a telephone. Include in your plan some basic steps and company philosophy (in easy checklist form) for dealing with emergency responders, the public and news media. Many plans we've audited surprisingly don't include these areas at all, or assume that such support will come out of a corporate office hundreds or perhaps thousands of miles away. To assume that the news media or local political official is going to be adequately communicated to over the telephone or hours into the event is naive and ineffective in this age of live press coverage and public sensitivity. Make sure your personnel are trained to use the emergency plan, and are not relying strictly on "gut instinct." Ideally, hold a tabletop drill or mock emergency response drill at least annually. Part II of this series will look at preparedness, response and recovery segment of the Homeland Security strategies, as well as protection of EPA personnel and infrastructure. This article originally appeared in the April 2003 issue of Environmental Protection, Vol. 14, No. 3, p. 34.